This article is about the chemical element. For other uses, see Argon (disambiguation). Ar is the remainder in such cases, whose content may be as low as 93.6%. Argon has approximately the same solubility in water as oxygen and is 2.5 times more soluble in water than nitrogen. Argon is colorless, odorless, nonflammable and nontoxic as a solid, liquid or gas. Argon is chemically inert under most conditions and forms no confirmed stable compounds at room temperature. Argon (Greek ἀργόν, neuter singular form of ἀργός meaning "lazy" or "inactive"), is named in reference to its chemical inactivity. This chemical property of this first noble gas to be discovered impressed the namers. An unreactive gas was suspected to be a component of air by Henry Cavendish in 1785. Argon was first isolated from air in 1894 by Lord Rayleigh and Sir William Ramsay at University College London by removing oxygen, carbon dioxide, water, and nitrogen from a sample of clean air. 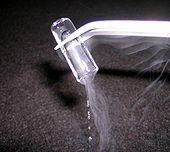 They had determined that nitrogen produced from chemical compounds was 0.5% lighter than nitrogen from the atmosphere. The difference was slight, but it was important enough to attract their attention for many months. They concluded that there was another gas in the air mixed in with the nitrogen. Argon was also encountered in 1882 through independent research of H. F. Newall and W. N. Hartley. Each observed new lines in the emission spectrum of air that did not match known elements. 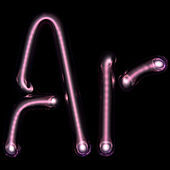 Until 1957, the symbol for argon was "A", but now is "Ar". Ar contamination. Dark-matter detectors currently operating with liquid argon include DarkSide, WArP, ArDM, microCLEAN and DEAP. Neutrino experiments include ICARUS and MicroBooNE, both of which use high-purity liquid argon in a time projection chamber for fine grained three-dimensional imaging of neutrino interactions. Argon is used as a propellant in the development of the Variable Specific Impulse Magnetoplasma Rocket (VASIMR). 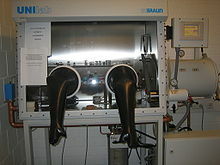 Compressed argon gas is allowed to expand, to cool the seeker heads of some versions of the AIM-9 Sidewinder missile and other missiles that use cooled thermal seeker heads. The gas is stored at high pressure. Argon-39, with a half-life of 269 years, has been used for a number of applications, primarily ice core and ground water dating. Also, potassium–argon dating and related argon-argon dating is used to date sedimentary, metamorphic, and igneous rocks. ^ In older versions of the periodic table, the noble gases were identified as Group VIIIA or as Group 0. See Group (periodic table). ^ Material Safety Data Sheet Gaseous Argon, Universal Industrial Gases, Inc. Retrieved 14 October 2013. ^ Leonid Khriachtchev; Mika Pettersson; Nino Runeberg; Jan Lundell; et al. (2000). "A stable argon compound". Nature. 406 (6798): 874–876. doi:10.1038/35022551. PMID 10972285. ^ Belosludov, V. R.; Subbotin, O. S.; Krupskii, D. S.; Prokuda, O. V.; et al. (2006). "Microscopic model of clathrate compounds". Journal of Physics: Conference Series. 29 (1): 1–7. Bibcode:2006JPhCS..29....1B. doi:10.1088/1742-6596/29/1/001. ^ Cohen, A.; Lundell, J.; Gerber, R. B. (2003). "First compounds with argon–carbon and argon–silicon chemical bonds". Journal of Chemical Physics. 119 (13): 6415. Bibcode:2003JChPh.119.6415C. doi:10.1063/1.1613631. ^ Hiebert, E. N. (1963). "In Noble-Gas Compounds". In Hyman, H. H. (ed.). Historical Remarks on the Discovery of Argon: The First Noble Gas. University of Chicago Press. pp. 3–20. ^ Travers, M. W. (1928). The Discovery of the Rare Gases. Edward Arnold & Co. pp. 1–7. ^ Lord Rayleigh; Ramsay, William (1895). "VI. Argon: A New Constituent of the Atmosphere". Philosophical Transactions of the Royal Society A. 186: 187–241. Bibcode:1895RSPTA.186..187R. doi:10.1098/rsta.1895.0006. JSTOR 90645. ^ "About Argon, the Inert; The New Element Supposedly Found in the Atmosphere". The New York Times. 3 March 1895. Retrieved 1 February 2009. ^ a b c d e Emsley, J. (2001). Nature's Building Blocks. Oxford University Press. pp. 44–45. ISBN 978-0-19-960563-7. ^ a b "40Ar/39Ar dating and errors". Archived from the original on 9 May 2007. Retrieved 7 March 2007. ^ Mahaffy, P. R.; Webster, C. R.; Atreya, S. K.; Franz, H.; Wong, M.; Conrad, P. G.; Harpold, D.; Jones, J. J.; Leshin, L. A.; Manning, H.; Owen, T.; Pepin, R. O.; Squyres, S.; Trainer, M.; Kemppinen, O.; Bridges, N.; Johnson, J. R.; Minitti, M.; Cremers, D.; Bell, J. F.; Edgar, L.; Farmer, J.; Godber, A.; Wadhwa, M.; Wellington, D.; McEwan, I.; Newman, C.; Richardson, M.; Charpentier, A.; et al. (2013). "Abundance and Isotopic Composition of Gases in the Martian Atmosphere from the Curiosity Rover". Science. 341 (6143): 263–6. Bibcode:2013Sci...341..263M. doi:10.1126/science.1237966. PMID 23869014. ^ Young, Nigel A. (March 2013). "Main group coordination chemistry at low temperatures: A review of matrix isolated Group 12 to Group 18 complexes". Coordination Chemistry Reviews. 257 (5–6): 956–1010. doi:10.1016/j.ccr.2012.10.013. ^ Barlow, M. J.; et al. (2013). "Detection of a Noble Gas Molecular Ion, 36ArH+, in the Crab Nebula". Science. 342 (6164): 1343–1345. arXiv:1312.4843. Bibcode:2013Sci...342.1343B. doi:10.1126/science.1243582. PMID 24337290. ^ Quenqua, Douglas (13 December 2013). "Noble Molecules Found in Space". The New York Times. Retrieved 13 December 2013. ^ Kleppe, Annette K.; Amboage, Mónica; Jephcoat, Andrew P. (2014). "New high-pressure van der Waals compound Kr(H2)4 discovered in the krypton-hydrogen binary system". Scientific Reports. 4: 4989. Bibcode:2014NatSR...4E4989K. doi:10.1038/srep04989. ^ "Periodic Table of Elements: Argon – Ar". Environmentalchemistry.com. Retrieved 12 September 2008. ^ Fletcher, D. L. "Slaughter Technology" (PDF). Symposium: Recent Advances in Poultry Slaughter Technology. Archived from the original (PDF) on 24 July 2011. Retrieved 1 January 2010. ^ Shields, Sara J.; Raj, A. B. M. (2010). "A Critical Review of Electrical Water-Bath Stun Systems for Poultry Slaughter and Recent Developments in Alternative Technologies". Journal of Applied Animal Welfare Science. 13 (4): 281–299. CiteSeerX 10.1.1.680.5115. doi:10.1080/10888705.2010.507119. ISSN 1088-8705. PMID 20865613. ^ Fraqueza, M. J.; Barreto, A. S. (2009). "The effect on turkey meat shelf life of modified-atmosphere packaging with an argon mixture". Poultry Science. 88 (9): 1991–1998. doi:10.3382/ps.2008-00239. ISSN 0032-5791. PMID 19687286. ^ Su, Joseph Z.; Kim, Andrew K.; Crampton, George P.; Liu, Zhigang (2001). "Fire Suppression with Inert Gas Agents". Journal of Fire Protection Engineering. 11 (2): 72–87. doi:10.1106/X21V-YQKU-PMKP-XGTP. ISSN 1042-3915. ^ Gastler, Dan; Kearns, Ed; Hime, Andrew; Stonehill, Laura C.; et al. (2012). "Measurement of scintillation efficiency for nuclear recoils in liquid argon". Physical Review C. 85 (6): 065811. arXiv:1004.0373. Bibcode:2012PhRvC..85f5811G. doi:10.1103/PhysRevC.85.065811. Ar Content in Argon from Underground Sources". Astroparticle Physics. 66 (2015): 53–60. arXiv:1204.6011. Bibcode:2015APh....66...53X. doi:10.1016/j.astropartphys.2015.01.002. ^ Zawalick, Steven Scott "Method for preserving an oxygen sensitive liquid product" U.S. Patent 6,629,402 Issue date: 7 October 2003. ^ "Schedule for Renovation of the National Archives Building". Retrieved 7 July 2009. ^ "Fatal Gas Embolism Caused by Overpressurization during Laparoscopic Use of Argon Enhanced Coagulation". MDSR. 24 June 1994. ^ Pilmanis Andrew A.; Balldin U. I.; Webb James T.; Krause K. M. (2003). "Staged decompression to 3.5 psi using argon–oxygen and 100% oxygen breathing mixtures". Aviation, Space, and Environmental Medicine. 74 (12): 1243–1250. PMID 14692466. ^ "Energy-Efficient Windows". FineHomebuilding.com. Retrieved 1 August 2009. ^ Nuckols M. L.; Giblo J.; Wood-Putnam J. L. (15–18 September 2008). "Thermal Characteristics of Diving Garments When Using Argon as a Suit Inflation Gas". Proceedings of the Oceans 08 MTS/IEEE Quebec, Canada Meeting. Retrieved 2 March 2009. ^ "Description of Aim-9 Operation". planken.org. Archived from the original on 22 December 2008. Retrieved 1 February 2009. ^ Alaska FACE Investigation 94AK012 (23 June 1994). "Welder's Helper Asphyxiated in Argon-Inerted Pipe – Alaska (FACE AK-94-012)". State of Alaska Department of Public Health. Retrieved 29 January 2011. Brown, T. L.; Bursten, B. E.; LeMay, H. E. (2006). J. Challice; N. Folchetti (eds.). Chemistry: The Central Science (10th ed.). Pearson Education. pp. 276 & 289. ISBN 978-0-13-109686-8. Triple point temperature: 83.8058 K – Preston-Thomas, H. (1990). "The International Temperature Scale of 1990 (ITS-90)". Metrologia. 27 (1): 3–10. Bibcode:1990Metro..27....3P. doi:10.1088/0026-1394/27/1/002. Triple point pressure: 69 kPa – Lide, D. R. (2005). "Properties of the Elements and Inorganic Compounds; Melting, boiling, triple, and critical temperatures of the elements". CRC Handbook of Chemistry and Physics (86th ed.). CRC Press. §4. ISBN 978-0-8493-0486-6.